Are you a refugee? Are you looking for work? The Bridge Renewal Trust in partnership with Renaisi, is delivering the Refugees Into Sustainable Employment (RISE) project. 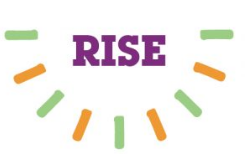 Project RISE is supported through the Building Better Opportunities (BBO) programme, which is funded by the Big Lottery Fund and European Social Fund. BBO is designed to support communities, families and individuals to gain the tools and skills necessary to find and sustain jobs they value – helping them to integrate, and increasing confidence and wellbeing.. The project will also offer Free ESOL support, various trainings including Level 1 Award in Preparing to Work in Adult Social Care, BTEC Level 1 Award in Health and Safety in a Construction Environment, Basic Level 1 in Retail Knowledge and help with benefits and housing. If you are interested in the project, please contact us on 020 8442 7657 or email habte@bridgerenwaltrust.org.uk. For more information, please see here.